Can You Play Flag Football With No Arms? Posted by Chet McDoniel Posted in General Posted in October 29, 2011 | Comments Off on Can You Play Flag Football With No Arms? Yesterday, my dad and I were invited to speak to a group of over 600 school teachers and administrators who were gathered at a Special Education conference in Decatur, TX. Now, the conference mainly focused on new laws and policies for special education, but our job was to put a face on special education and to inspire teachers going into the new school year. We told many stories of my educational background including how my parents were able to get me “mainstreamed” (I understand the term now is “inclusion.”), and how special adaptations in the classroom helped me to become the educated person I am today. Most of all, though, the positive attitude of the teachers and school administrators throughout my life really allowed me to flourish. My dad mentioned that he heard of people wanting to “take on the school system”…we never had to…the school systems I was involved in always bent over backwards to help me accomplish my goals. These teachers were a great crowd, and many visited with me afterwards about how much our presentation helped them going into this new school year. We hope to have many more occasions to speak to both students and teachers in the future. Inspiring teachers allows us to inspire the thousands of students they inspire every day! 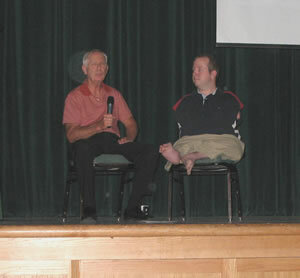 Jim and Chet McDoniel are inspirational speakers and are available to present to your school’s faculty and/or students. Chet’s unique view of life without arms allows him to inspire students in ways no one else can. Click here to request more information. This past Friday, I was given the opportunity to speak to WorkReady, Inc. WorkReady helps people with special needs find jobs that would not only be suitable for them, but where the company doing the hiring is also willing to make adaptations as needed. As I learned more about them, I became very impressed with them and their mission. I applaud there efforts and told them so on Friday. A part of me felt like I was “preaching to the choir,” so to speak. These employees work day in and day out helping people to use what they have instead of wishing their situation to be different. That’s one of my points when I speak. We can all sit around and wait for our circumstances to get better, or we can choose to use what we have to live life to the fullest. No reason or circumstance can keep me from living a full and happy life…not even a lack of arms. I appreciate WorkReady, Inc. and other companies who are helping people to live better lives.